A rare blog, I’ve not been instagramming much either because during Mercury Retrograde my computer and phone went completely insane. My phone was making calls on it’s own and jumping from app to app. My computer was refusing to send emails, but wouldn’t quit mail! Annoying but stopped me playing on my phone and encouraged me to STOP! I am writing my newsletter but need more space to write about these prints. A natal chart is the symbolic representation of the sky at the moment you were born. Like a photograph of the astrological weather! It is the horoscope. A horoscope is an astrological chart or diagram representing the positions of the Sun, Moon, planets, astrological aspects and sensitive angles at the time of an event, such as the moment of a person’s birth. 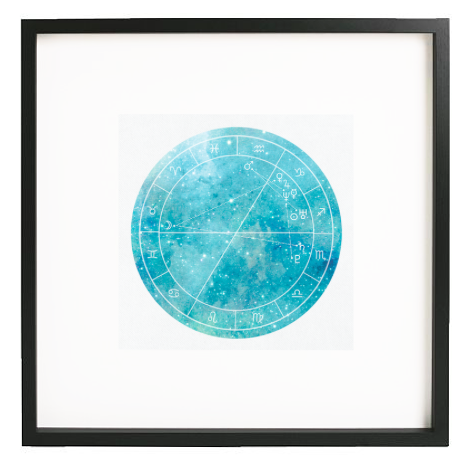 The word horoscope is derived from Greek words hõra and scopos meaning “time” and “observer” (horoskopos, pl. horoskopoi, or “marker(s) of the hour”). 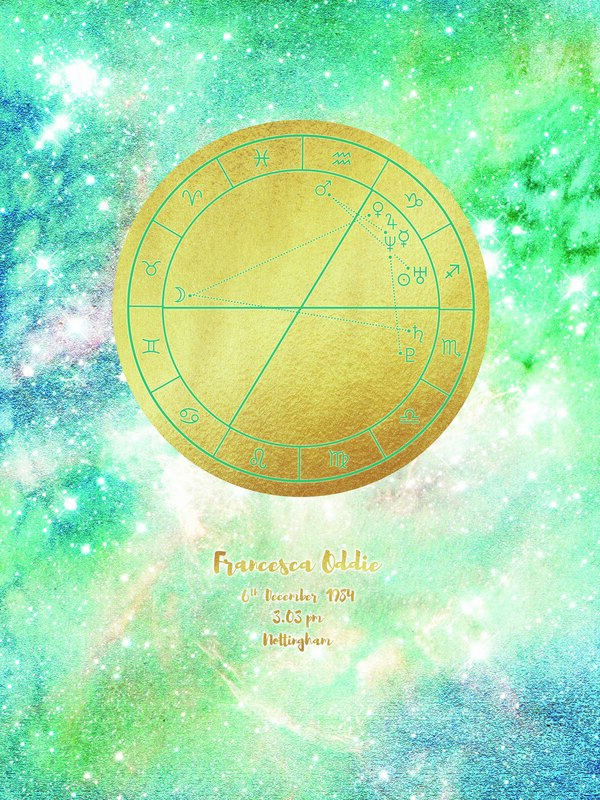 Other commonly used names for the horoscope in English include natal chart, astrological chart, astro-chart, celestial map, sky-map, star-chart, cosmogram, vitasphere, radical chart, radix, chart wheel or simply chart. 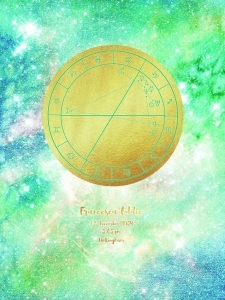 Each natal chart is unique, it’s a beautiful representation of your soul, your direction and lessons for this life. To have it mapped out and on your wall is a reminder that you are unique, remarkable and that your life has purpose. Even if you do not understand the astrological symbols, the energy of the chart remains. Why did I create these? 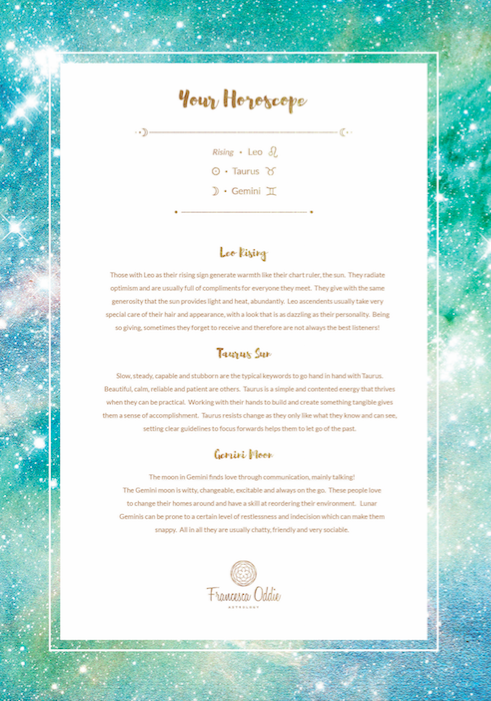 I made these charts because I LOVE ASTROLOGY (we know that!) but there wan’t a beautiful chart to give to my clients. I love to follow up with an email and some info about yourself, some takeaways that I think will support you going forwards. Snippets of advice. 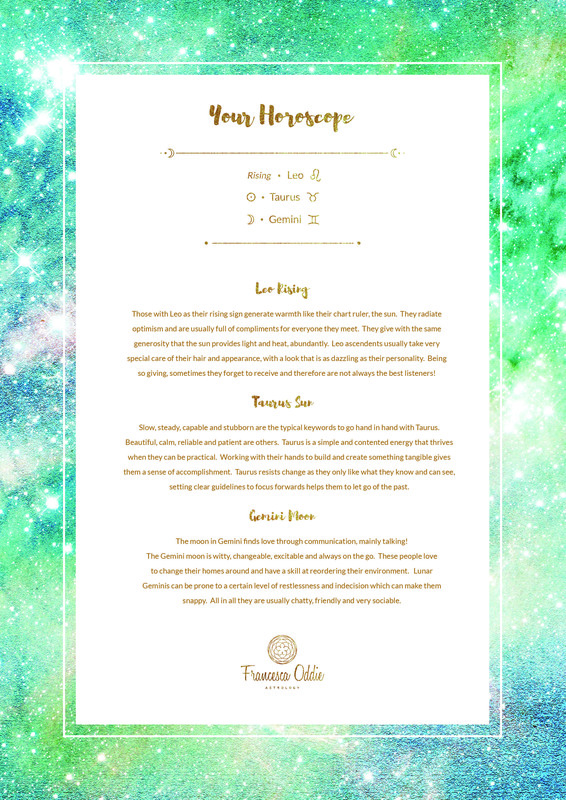 However, I couldn’t find any beautiful charts to give to people so I made some! I didn’t know how to make the chart look nice with words, but Katy did so here is what we made! I offered an alternative sheet too. These are both soon to be available on Etsy. Grab them here before the end of September 2017 for £35. If you like the simple looking chart, I can write out the info on a separate sheet. Who or what to I buy a chart for? Buy one for yourself, or for the birth of a baby. Also, mark a date! The energy of any significant moment is captured in the energy of a chart (or horoscope) so they are great for weddings, business launches, the date you met your love or the date you first Facebook stalked your lover! I currently have two options of frames, the simple A4 Frame and this mounted print (as above.) I’m working on larger images in larger frames as I think they look cool. 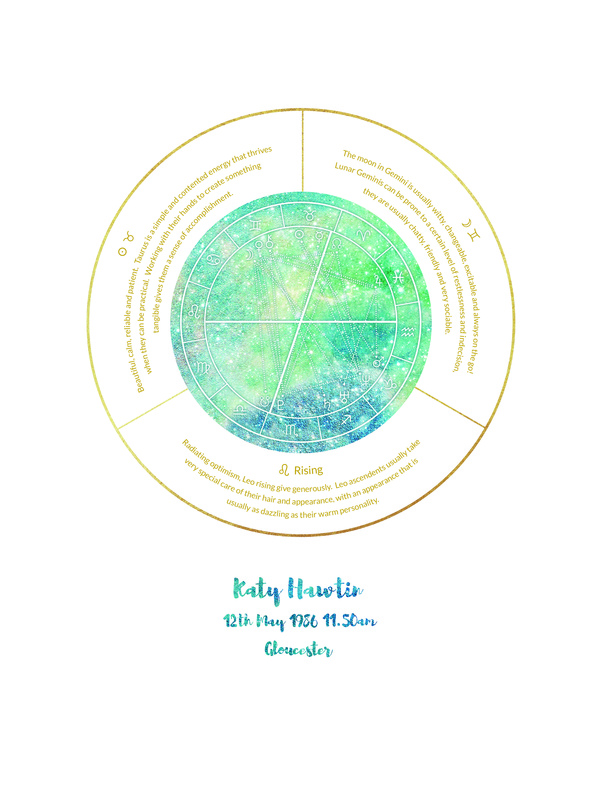 I really like these charts too with the starry background, they look great slightly bigger in a big clear frame. More to come on that if you want one I’ll draw up a price for you depending on whether you want a frame! Tell me what you think to being sent a digital copy that you frame yourself? This means you can use your chart to put on anything that you want to print. Cushions, mugs, cards, phone covers… etc… Keen for that? Let me know! Thanks for reading and I’ll update you when my site is freshly updated! FULL MOON BLESSINGS BABES. The moon is in Pisces, creative vibes are swirling around us. Get mediating and keep loving. Pisces knows that love is the answer. Hippie vibes abound! New Year, New Me… New Year, Fresh Dreams! 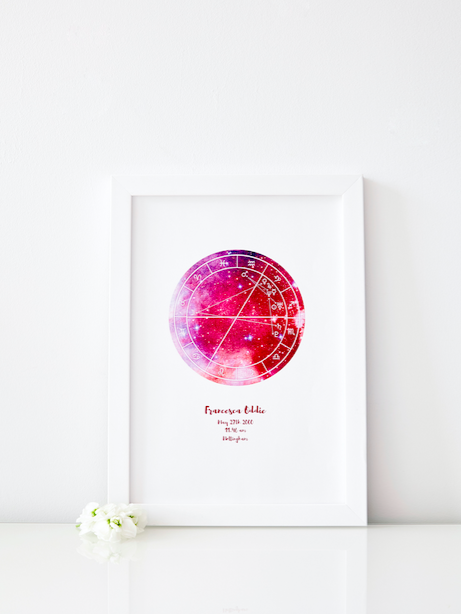 For the love of Astrology! Subscribe for my friendly updates! Please sign up to my newsletter, I promise to send you only useful, interesting and entertaining updates once a month! 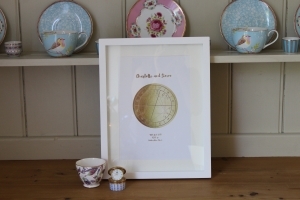 This newsletter includes discount codes for chart prints and news about events.